Los Angeles based Bob Pritchard BsC, BBA, CSP , AISMM is one of the world’s leading business and marketing presenters. 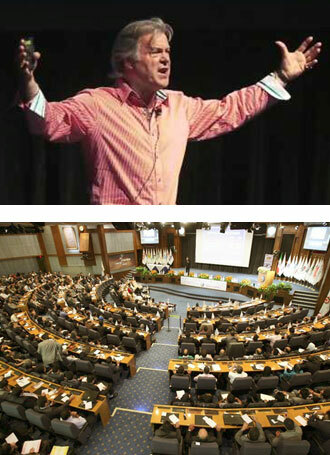 He has addressed over 1940 companies, including 91 Fortune 500 companies in 63 countries on 5 continents. Out of approximately 6500 professional speakers in the world, Bob is one of the few awarded the Certified Speaking Professional from the National Speakers Association. His standing ovations, enthusiastic testimonials and repeat business attest to the results he achieves from an audience. extensive high level global, multi industry business experience. continuous discussions with the world’s business leaders and entrepreneurs through his global radio program. commitment to extensive client briefings, meticulous preparation on the client, their industry, potential market and regulatory changes and then planning and crafting a presentation that specifically addresses the clients requirements. Bob has an extensive command of every aspect of business…from personal experience at the pointy end. Irrespective of whether the clients challenge is strategy, marketing, advertising, customer service, differentiation, maximizing new media, confronting change, leadership or another aspect of business Bob is eminently qualified. Every presentation is carefully crafted only after a detailed written briefing process has been completed and a comprehensive phone discussion held with the client so that the client’s brief and objectives are clearly understood and delivered. Bob then conducts research and develops the presentation to address those specific objectives. Bob has major clients in the following sectors: Financial, Technology, Retail, Motor Vehicle, Education, Pharmaceutical, Government, Associations, Travel, Real Estate, Advertising and Public Relations Agencies, Hospitality, Manufacturing, Marketing, Insurance, Entertainment/Media, and Sport. See a list of some clients here. It has been said that ‘Bob is the most value for money’ speaker in the world. Please contact us for a quote. margie@bobpritchard.com. Bob has homes in Los Angeles, California and Sydney, Australia. Bob requires business class travel from nearest residence to the presentation, quality accommodation and ground transport. For a Keynote, Bob requires a screen for PowerPoint presentations and video (with remote control), a lectern and a lapel microphone. For workshops Bob also requires a whiteboard. Bob has literally a thousand testimonials. W Mitchell, International Speaker & Author.